Now that Jim's sister and my brother and their families live in Florida, we thought it would be good to make a visit to see everyone. Instead of flying down and renting a car, we decided to drive and do some sight-seeing on the way. We hated to leave Virginia in the most lovely section of spring, but the first week of April was the only time we could get away. The sightseeing portion of our trip down didn't result in any pictures. We drove as far as Columbia, SC, the first night and planned to visit the area around Orangeburg on our way to the next night in Savannah, GA. it rained all day. We got lost around Orangeburg. We didn't see anything we had expected to find. In Savannah I left the camera in the car. We contented ourselves with riding around town in the free tourist bus and catching a bite to eat while planning what we would do next time. 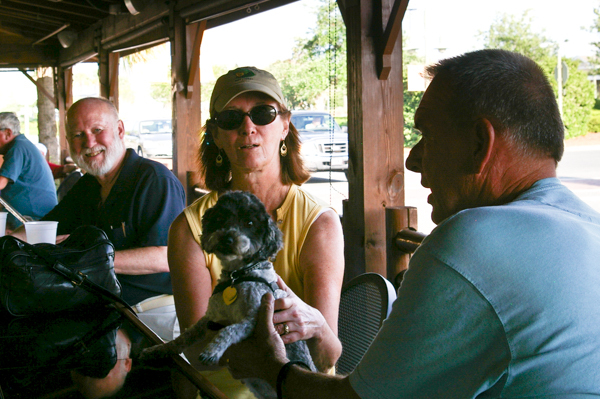 Grace and Steve moved last year to The Villages, a planned community between Ocala and Orlando in central Florida. It is geared to active older adults. 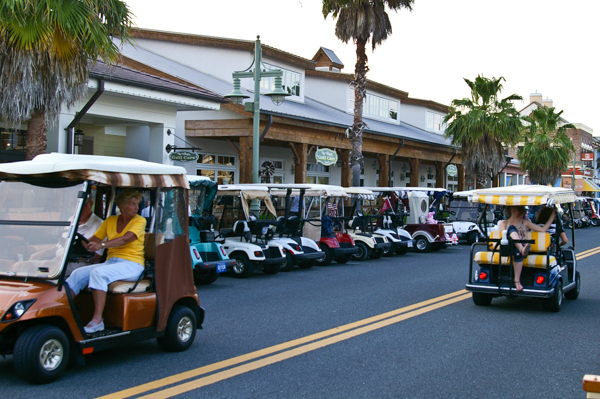 Golf carts are the accepted mode of transportation with special golf cart paths or golf cart lanes on roads throughout the development. During the evening entertainment at the nearby town square, it was hard to find a place to park your cart. Parking an actual car would be even more daunting. Grace & Steve had purchased their own cushy cart, but it only had space for two. Since there were numerous friends and family visiting this spring, they rented a spare. Steve was very annoyed that the rental had a top speed of only 18mph! Since I've done a lot of golf cart driving in connection with horse show volunteering, Jim let me do the driving. It's rather more intimidating to drive a cart along a major thoroughfare than around a horse show facility! But we survived. 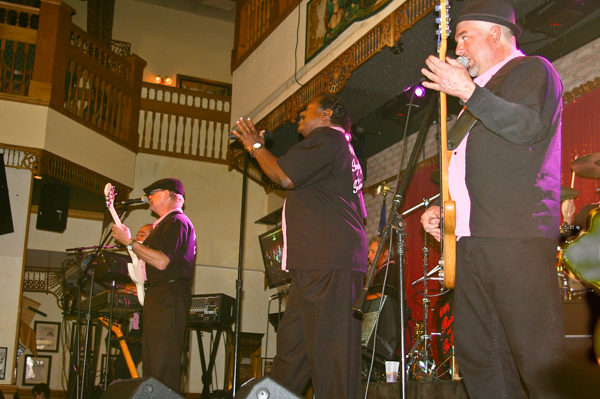 We went out one night for dinner at Katie Belle's to hear Rocky & the Rollers -- one of Grace's favorite bands. They put on a great show to a packed house. The dance floor was crowded with patrons of all ages. 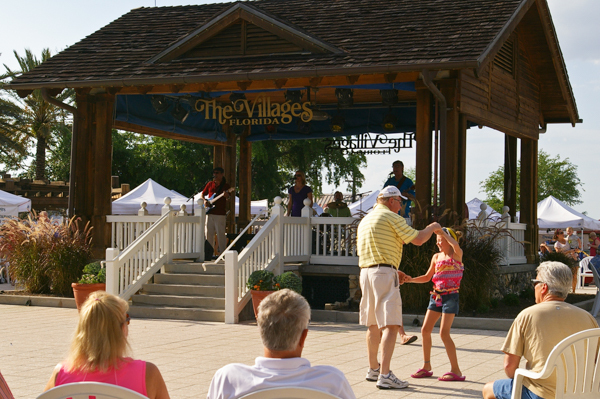 Many of the bands and individuals that perform locally actually live in The Villages. 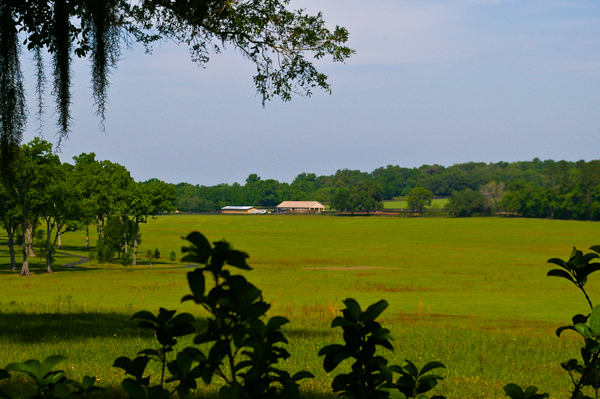 In addition to giving us tours of the sights and amenities of The Villages, Steve took us on a tour of nearby Ocala with its numerous horse farms (hundreds in a 50-mile radius). We weren't able to arrange any stable tours in our limited time, but we did enjoy seeing the lovely countryside. Back in The Villages we drove downtown to the Lake Sumter town center for an afternoon concert. Grace and Steve take their little dog Winnie with them everywhere. Winnie is enjoying a cool drink of water on this hot afternoon. There is entertainment almost every afternoon at the town centers. This is just an ordinary Tuesday with a live band, dancing, and a craft fair. Almost every seat was taken -- except when the occupants were dancing. After enjoying the music we retired to a nearby BBQ joint for dinner. Winnie can belly up to the bar with the best of us, but she is limited to official doggy treats. 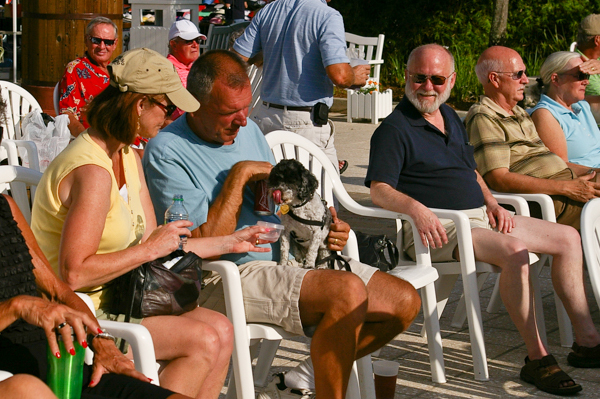 The Villages is very pet-friendly. We were sorry that Hoppy doesn't enjoy travel any more. He likes riding in the car, but he doesn't like staying in a different motel every night even though we bring along his home kennel. He would have enjoyed seeing Winnie, but he was happier at Wellspring where he could watch TV every night with Mary. 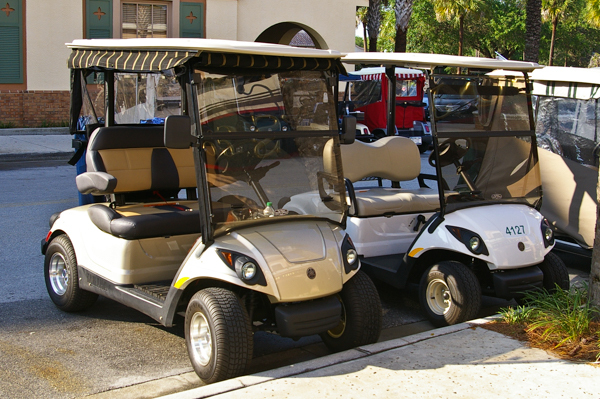 I took lots of pictures of custom golf carts (my brother tells me I take way too many pictures of places and too few of people). This is clever but by no means the most elaborate. 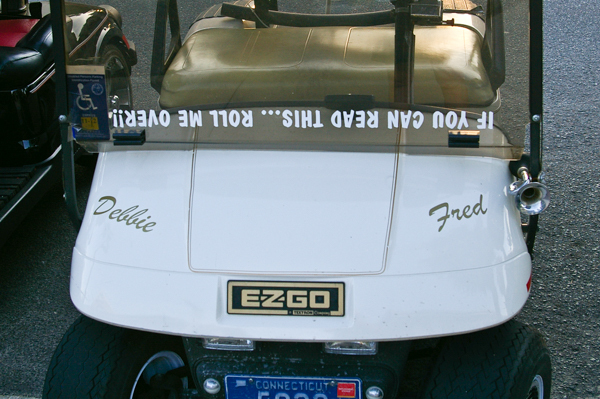 It is common for the owners to put their names and license tags from the home state on the carts. After an enjoyable couple of days with Grace & Steve, we bid farewell and drove to Winter Springs to see my brother Emmett and family. We also had a great time visiting there. 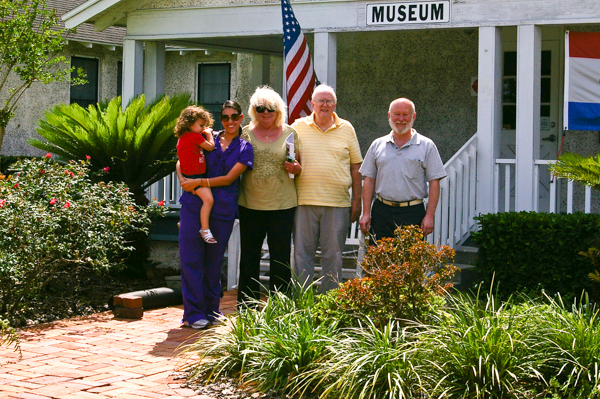 The Seminole County Museum is in Sanford where Carroll does substitute teaching. From left to right are Olivia, Anne, Carroll, Emmett and Jim. The museum is located in the "Old Folks Home" built in the early 1900s. Afterwards we had lunch in the historic district at a fabulous German restaurant, the Willow Tree Café. Anne & Olivia having a fun moment. Livy is a darling three-year-old. After an all-too-brief visit with our families, we headed back home to Virginia. We hadn't planned on doing any sight-seeing on the trip home, but heavy traffic on I-95 and a beautiful day tempted us onto US-21. 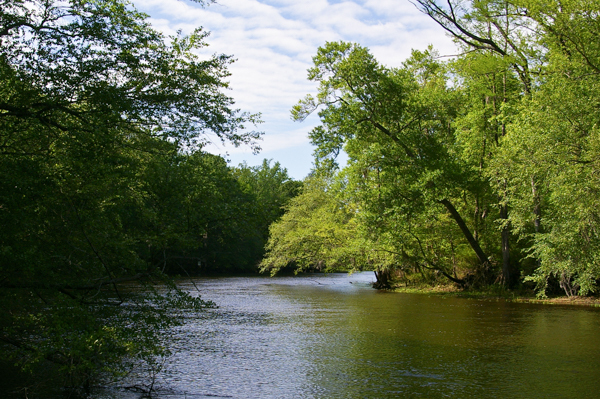 My ancestors lived along the banks of the Edisto River back in the 18th century before relocating to Louisiana. I imagine that they felt right at home there since this area of South Carolina is very like Louisiana and south Mississippi. US-21 took us into Orangeburg where we finally found downtown. There was nothing from the 18th century. 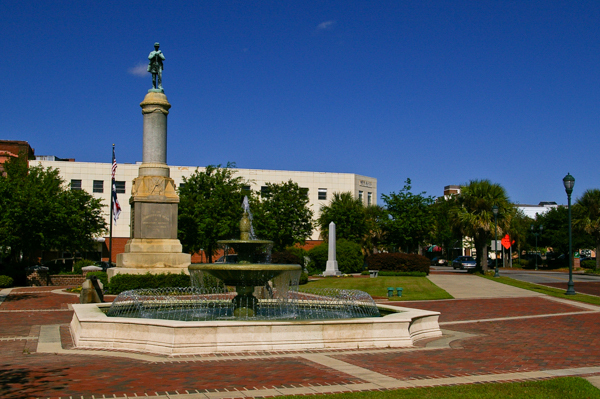 This park is located on the site of the original courthouse, which was burned during the Civil War -- along with most, if not all, civil records pertaining to the inhabitants prior to that time. As luck would have it, however, the church record of births and marriages was preserved in ... the Netherlands! Transcriptions and scanned images may be found online in the Orangeburg Book of Record. We were glad to visit our family, but even gladder to return home and find that the dogwoods and redbuds were still in bloom. Although the daffodils are all gone, tulips and lilacs have taken their place.